Few aircraft are as well known or were so widely used for so long as the C-47 or “Gooney Bird” as it was nicknamed. The aircraft was adapted from the DC-3 commercial airliner which appeared in 1936. The first C-47s were ordered in 1940 and by the end of WW II, 9,348 had been procured for the USAAF. They carried personnel and cargo, towed troop-carrying gliders and dropped paratroops into enemy territory. They participated in the Berlin Airlift, the Korean War, and the Vietnam War. 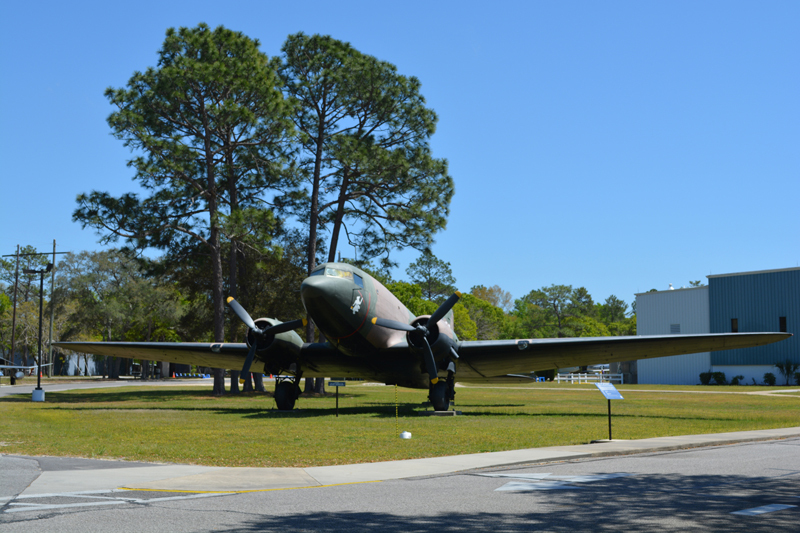 The development of the “Gooney Bird” as a gunship was largely due to a pilot’s need to train his guns on a site and continue to circle the site for long periods of time, while continually hitting the target with reasonable accuracy. The flight testing of these “gun ships” was accomplished here at Eglin AFB, FL in 1964, using three 7.62mm SUU-11A Gatling mini-guns. On December 2, 1964, the first AC-47s arrived in Vietnam and were assigned to the 1st Air Commando Squadron. The ground troops affectionately called the AC-47 “Puff – the Magic Dragon”. It was noted that the Viet Cong never seeing such an attack from the sky, thought it to be a fire breathing dragon. “Spooky” became the call sign for the AC-47 and that name is the one that stuck with the AC-47. This C-47K S/N 44-76486 is being depicted as AC-47D S/N 43-49010 which was one of the first twenty C-47Ds converted to its AC-47D configuration by Air International at Miami, FL. AC-47 S/N 43-49010 was assigned to the 4th Special Operations Squadron, 14th Special Operations Wing, Udorn RTAFB, Thailand during the Vietnam War from 1969 - 1970.